I LOVED this book. I always say that the world would be a better place if everyone read Palacio's Wonder. Now, I can say that about a second book: Lily and Dunkin. It's an interesting, unique read that will go a long way toward helping young teens (and adults) empathize with people who are different from them. SUMMARY: Lily is a transgender teen who is taking small steps to embrace who she truly is: a girl with male anatomy. Dunkin is a boy who misses his father and deals daily with his bipolar disorder. Alternates between Lily's and Dunkin's voices. REVIEW: I loved this book! It's a beautifully-written story of an emerging friendship between two eighth graders dealing with some pretty heavy secrets. Author Donna Gephart tackles some serious issues here--transgender identity, bipolar disorder, bullying, abuse, grief, homosexuality--with grace and sensitivity. I cannot imagine that someone could read this book and not come away more sensitive to transgendered and bipolar individuals. The strong characters feel like real people, and now that I'm finished, I am sad to see them go. I think my favorite character was Lily's Dad, who represents a huge chunk of the American population in proclaiming that "A boy is a boy is a boy." Both Dunkin's and Lily's families are strong and (mostly) supportive, but Lily's dad really struggled. He does try so hard to understand and protect Lily. This book could be an agent for change. I think differently about transgenders because I read this book. While I would never bully someone over their gender identity, I don't really understand it, either. But while I was reading this book, I ran across an article about the transgender bathroom (non)issue. I made the mistake of reading the public comments on the article, and I was upset that so many people could be that awful about where someone pees. It's really disappointing and a sad commentary on where we are as a society. While we have made huge strides in protecting and accepting homosexuality, we still have a long way to go in accepting transgenders. When you finish the book, don't skip the author's note at the end. 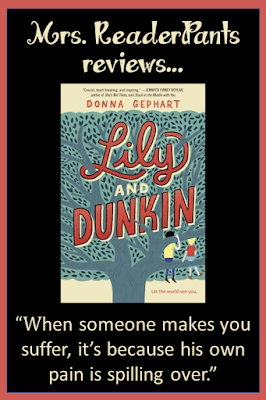 Ms. Gephart writes about her different inspirations for Lily and Dunkin. Her story about Dunkin and her own son's bipolar disorder is touching--no wonder she writes so well about this topic. For me, this is Newbery Award material. This unconventional story has the power to change minds, something desperately needed in today's world. THE BOTTOM LINE: I worry that more conservative school libraries will be afraid to carry this title. Even the most conservative communities need this book. It's beautifully-written and will help open people's hearts. Do not miss it. STATUS IN MY LIBRARY: We have two uncataloged copies (one is mine that is being donated; the other just arrived two days ago). I booktalked this title in all my classes last week, and I'm interested to see how it does. Characters: 5/5--loved the strong characterizations! Language: mild; bully repeatedly uses the slur "fag"
I just processed this book yesterday and it's on my TBR pile (theoretically). It's actually on display waiting for a student to discover it--but I will get to it soon! Did you read Gracefully Grayson? I enjoyed that very much too.